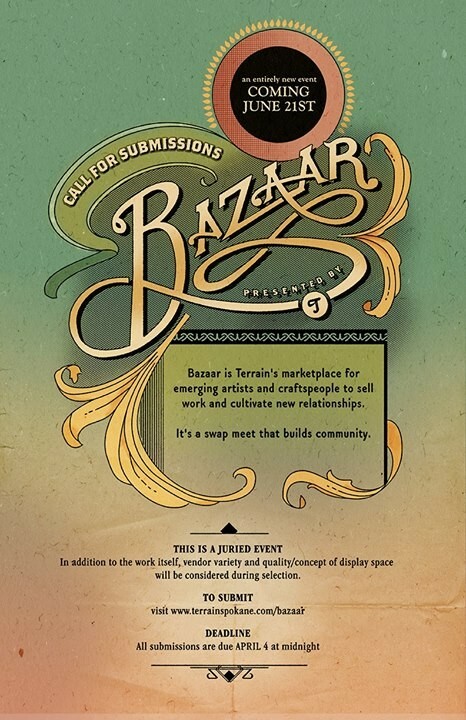 Calling all artists and craftspeople — Terrain is now taking submissions for Bazaar, a new event scheduled for June 21. Like Terrain, the event is juried, but Bazaar is described as a “swap meet that builds community” and sounds sort of like real-life Etsy. Suggested items include photographs, paintings, prints, handmade or up-cycled furniture, clothing, candles, soap or really anything you made. Submissions are due April 4. The location is still being finalized, and may be indoors or outdoors. The idea behind Terrain has always been making the local art culture more vibrant and viable, and a big part of supporting young, emerging artists is creating more young art patrons. “We’ve kind of realized in the past couple of years that one part of [supporting artists] is cultivating a young artist patronage, basically — so getting young people to choose local and handmade art as opposed to going to like World Market or Pier One,” Terrain co-founder Baumgarten said recently in a Spokane Film Project podcast. An original painting may retail for several hundred dollars, for example, but then artists should also have prints at cheaper prices for people who can’t afford to spend a month’s rent check on art. Also within the next couple of months, they’re planning to launch a Kickstarter campaign to help Terrain transition from an all-volunteer project to a full arts organization. Check out the Bazaar submission form and rules here. Listen to the podcast where Baumgarten and Ginger Ewing talk more about the idea here. (The part specifically about Bazaar begins around 9:30.) If you’re looking for a little pre-Bazaar, pre-Terrain art fix, swing by Ewing’s inaugural Window Dressing display at 1011 W. First Ave.